I am particularly pleased, dear brothers and sisters, to meet the National Directors of the Pontifical Mission Societies from all over the world for the first time. I cordially greet Cardinal Fernando Filoni, I thank him for the service that he carries out as Prefect of the Congregation for the Evangelization of Peoples, as well as for the words he addressed to me on your behalf. Cardinal Filoni has an extra task to carry out in this period: he is a professor. Come to me and “teach me something about the Church.” Yes, he comes and tells me: this diocese is like this and so forth … I know the Church thanks to his lessons. These are free lessons. I also greet the Secretary, Mgr. Savio Hon Tai-Fai, the Assistant Secretary Mgr. Protase Rugambwa, and all the employees of the Dicastery and of the Pontifical Mission Societies, priests, religious men and women, laymen and laywomen. 1. I would like to tell you that you are particularly dear to me because you help to keep the work of evangelization alive, the paradigm of every act of the Church. The missionary aspect is the paradigm of every act of the Church; it is a paradigmatic attitude. In fact, the Bishop of Rome is called to be a Pastor not only of his particular Church, but also of all the Churches, so that the Gospel can be preached to the world. And in this task, the Pontifical Mission Societies are a privileged instrument in the hands of the Pope, who is the beginning and sign of the unity and universality of the Church (cf. Second Vatican Ecumenical Council, Dogmatic Constitution. Lumen Gentium, 23). They are called “Pontifical” because they are at the Bishop of Rome’s direct disposal, with the specific purpose of acting so that the precious gift of the Gospel might be offered to all. They are entirely relevant; even more, they are still necessary today because there are so many peoples who have still not known and met Christ and it is urgent to find new forms and new ways that God’s grace might touch the heart of each man and each woman and bring them to Him. All of us are his plain yet important instruments; we received the gift of faith, not to hide it but to spread it so that it might enlighten the path of many brothers and sisters. 2. Of course, a difficult mission awaits us ahead, but with the guidance of the Holy Spirit, it becomes an exciting mission. All of us experience our poverty, and weakness in bringing to the world the precious treasure of the Gospel, but we must constantly repeat Saint Paul’s words: “… We hold this treasure in earthen vessels, that the surpassing power may be of God, and not from us” (2 Cor 4:7). This must always give us courage, knowing that the power of evangelization comes from God, and belongs to Him. We are called to open ourselves more and more to the Holy Spirit, to offer all our willingness to be instruments of God’s mercy, his tenderness, his love for every man and every woman, and especially for the poor, the excluded, and the marginalized. And this holds for every Christian, for the whole Church. It is not an optional mission, but an essential one. As Saint Paul said: “If I preach the Gospel, this is no reason for me to boast, for an obligation has been imposed on me, and woe to me if I do not preach the Gospel” (1 Cor 9:16). God’s salvation is for everyone! 3. To you, dear National Directors I repeat the invitation that Paul VI addressed, almost fifty years ago, to safeguard zealously the universal scope of the Missionary Societies, “that have the honor, the responsibility, the duty to support the mission [ to proclaim the Gospel], to administer the necessary aid” (Address to the Pontifical Mission Societies, May 14, 1965: AAS 57, 1965, 520). Never tire of educating every Christian from childhood, to have a genuinely universal and missionary spirit, and to raise awareness in the entire community about the need to support and help the missions according to the needs of each (cf. Second Vatican Ecumenical Council, Decr. Ad Gentes, 38). 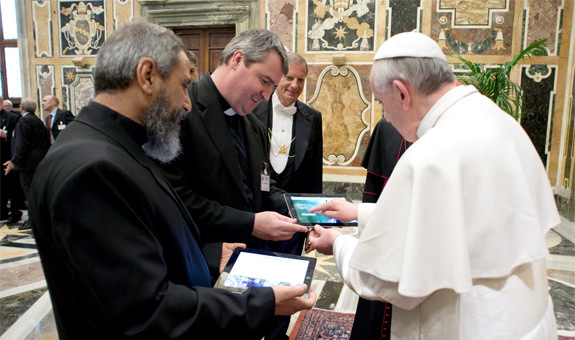 Make sure that the Pontifical Mission Societies continue in the path of their centuries-old tradition, to give life and education to the Churches, opening them to the broad dimension of the mission of evangelization. The Pontifical Mission Societies also properly belong to the concerns of the Bishop s so that they might be “rooted in the life of particular Churches” (Pontifical Mission Societies, statutes, 17), they must truly become the privileged instrument of education towards a universal missionary spirit and an ever-greater communion between Churches to proclaim the Gospel to the world. Faced with the temptation of communal self-centredness, worried about your own problems, your job is to recall the “missio ad gentes”, to bear witness prophetically that the life of the Church and the Churches is the mission, a universal mission. The Episcopal ministry and all ministries are certainly geared towards the growth of the Christian community, but they are also at the service of communion between Churches for the mission of evangelization. In this context, I invite you to pay special attention to the young Churches, which often operate in a climate of difficulty, discrimination, and persecution, so that they might be sustained and assisted in witnessing the Gospel in word and in deed. Dear brothers and sisters, in renewing my thanks to you all, I encourage you to continue your work so that the local Churches may ever more generously assume their share of responsibility in the Church’s universal mission. Invoking Mary, Star of evangelization I make Paul VI’s words my own, who said: “May the world of our time, which in searching, sometimes with anguish, sometimes with hope, be enabled to receive the Good News not from evangelizers who are dejected, discouraged, impatient or anxious, but from ministers of the Gospel whose lives glow with fervor, who have first received the joy of Christ, and who are willing to risk their lives so that the Kingdom of God may be proclaimed and the Church established in the midst of the world” (Evangelii Nuntiandi, 80). Thank you. To you, your employees, your families, and to all those you have in your heart, to your missionary work, Blessings to you all.